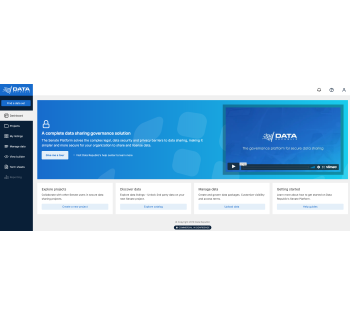 Data Republic delivers a comprehensive technology suite which solves the complex legal and technical barriers to data sharing/exchange both within and outside an organization while protecting information security and data privacy. With Data Republic data sharing is safe, secure and scalable. The Senate Platform revolutionizes data sharing between organizations by providing comprehensive legal, governance and licensing workflows aligned with GDPR/CCPA compliance. The Senate Platform helps organizations foster new data partnerships and connect to the global data economy. Within Senate is patented Senate Matching technology. This solution revolutionizes customer privacy protections when matching data at the personal level by providing a more secure, decentralized alternative to common hashing or encryption methods. With Senate Matching, organizations can de-identify at the source (on-prem) with military/bank-grade encryption and match datasets without customer's personally identifiable information (PII) ever having to leave an organization’s secured IT environment. What's possible with Senate and Senate Matching? Customer Data (CRM) Enrichment, Joint Audience Creation & Definition for Partnerships & JVs, Scale Data Exchange, Data Monetization, Innovation & Events (Audits, Datathons/Hackathons, and Controlled Exploration/Discovery). Who is using Senate and Senate Matching? Major airlines (Qantas Loyalty, Singapore Airlines), banks and financial services (Westpac, ANZ, National Australia Bank and American Express), federal and local government, telcos and retailers.